Another weekend and another unbelievable game of rugby, this time between two old adversaries in Leinster and Munster. Congratulations to the blues and commiserations to the red army on what was a nail-biting battle. 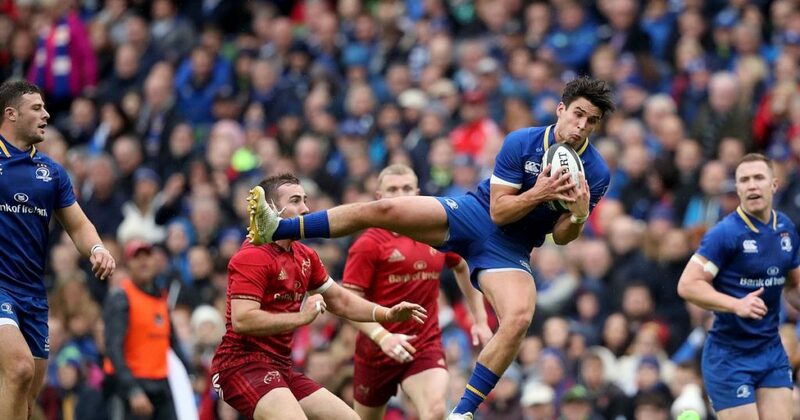 It seems like every week now Leinster are cleaning house, but they still have one more big weekend in store against the Scarlets before the season fully wraps up. Again, yesterday’s game seen a few big casualties picked up with Jack O’Donoghue sustaining a nasty looking leg injury after tackling James Ryan in a ruck. Leinster captain Isa Nacewa was forced off at the end of half time with a calf problem in his final game at the RDS and JJ Hanrahan had to leave the pitch with a hip injury after 45 minutes. To recap on our series, part one on injury avoidance in rugby looked at best practices, the right way to prepare and how to mange concussion. In part two, we turned our attention to lower body injuries and solutions by focusing on the most common problems that occur on the pitch for hip, hamstring, knee and ankle injuries. In part three of our series we will discuss upper body injuries that can happen in rugby. The most common problem areas like shoulder, arm, elbow and wrist will be explored and we will outline the recommended treatments and solutions that go with these injuries. A shoulder injury is a tricky injury to recover from. The length of time for a player will vary, depending on the extent of the damage to the shoulder. There are a few different types of shoulder injuries but we will take a look at the most common. 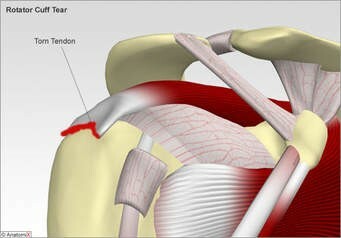 Rotator Cuff: Caused by wear and tear to the tendon and over use or abuse. Broken Shoulder: This is caused by a hard collision causing the clavical to break. 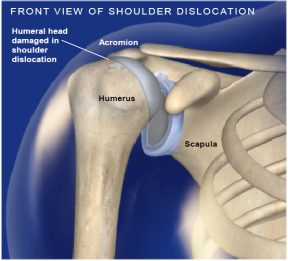 Dislocated Shoulder: This is where the humerus comes out of the socket as shown in the diagram. Initial treatment is to use a sling to ease the pressure on the joint, the muscles and tendons. It is a very painful injury and needs careful treatment to prevent further injury. 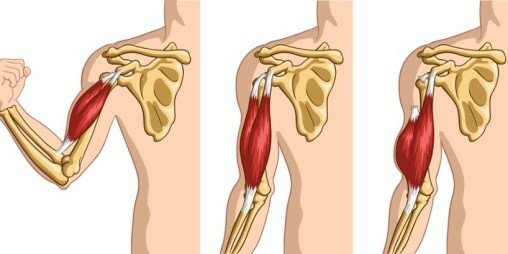 Muscle Tear to the Deltoid: This is where a muscle has a tear due to a collision or if the muscle is over stretched. Tears are graded as grade 1, grade 2 and grade 3. The grade depends on the size of the tear and recovery time depends on what grade of tear it is. Massage and rest is recommended as part of recovery. 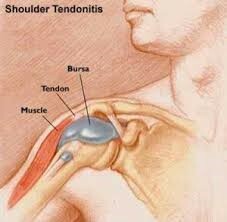 Shoulder Tendonitis: This is caused again by repetitive movement of tendons. Treatment includes using Kinesiology tape to support the shoulder. Kinesiology tape gives support, pain relief and improves circulation. Also a hot bath in Epsom salts would be a good help. 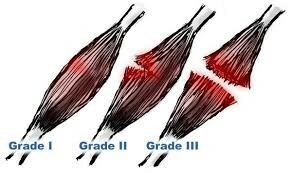 Muscle Tears and Tendon Tears are classed as Grade 1, 2 or 3 tear. 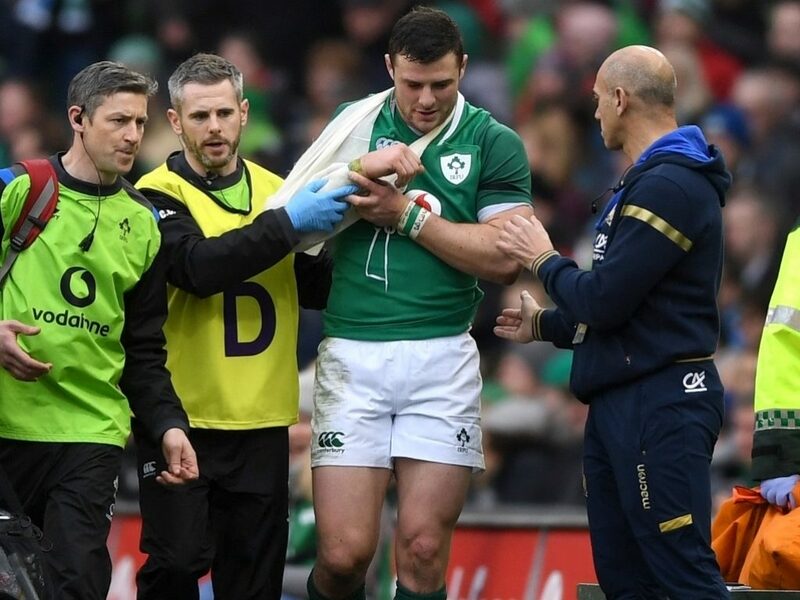 The most recent example of a high profile shoulder injury occurred when Ireland international Robbie Henshaw scored a try for Ireland early in the 2018 Six Nations. After grounding the ball, players from the opposing team jumped on Henshaw, which put high pressure on the shoulder that caused the injury. Arm injuries are highly common in rugby, from bicep and tricep injuries to elbow and wrist injuries. As I mentioned earlier, there are 3 grades of tear from 1-3 and the recovery time depends on the grade of tear, we can see these below. A lower grade bicep tear is easy to treat with rest, massage and Kinesiology taping. Causes are varied but high impact challenges, players studs in the arm when going for the ball when a player has his or her arm on the ground and another player is still standing and going for the ball, over stretching as well. A grade 3 tear would require surgery and further hospital treatment. There are other treatments for grade 1 & 2 tears. Distal Biceps Tendon Rupture is another tricky injury because it is a grade 3 tear which is a complete tear. It will requires surgery and is considered a long term injury. A tricep tenden rupture is similar and explained in detail during the video below. Other injuries would include bruises of these muscles, this can lead to complications if bruising keeps happening without treatment. It is very treatable if immediately addressed. 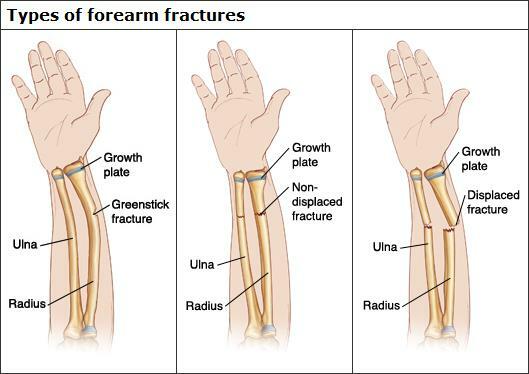 The most common lower arm injuries in rugby are a fractured ulna or fractured radius. Recovery varies depending on the type of fracture which would be either an open or closed fracture. The below diagram shows the various types of breaks which commonly occur. 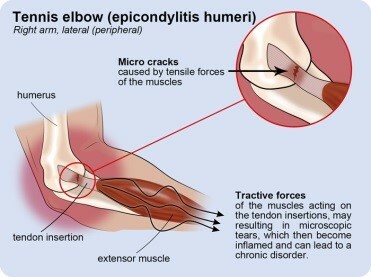 Elbow injuries can vary and be connected to a ruptured bicep tendon. Bruising of the joint can happen around the elbow as well. It is simple to treat but again, if left untreated can lead to complications. Golfers and tennis players are also known to struggle with similar elbow injuries. Strains, sprains, dislocations and fractures can happen due to players falling on another players arm. Any type of large weight or heavy pressure being placed on the elbow can cause injury. A fractured humerus can happen in the upper arm, lower arm, the ulna and radius. There are 2 main injuries that can happen to this part of the body, they are a sprained and fractured writs. Sprained Wrist: This can happen when a player scores a try or grounds the ball and puts excessive pressure on it. As a result the ligaments become over stretched causing severe pain to the player. Depending on the severity of the sprain, the ligaments may tear partially or fully which complicates the injury and will require much longer recovery time. A scan or x-ray will show the extent of the damage to the wrist. Suggested treatment is rest, no heavy lifting of any kind and a wrist support like the below. 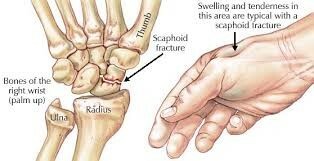 Fractured Wrist: A fractured wrist is a complicated injury, the key indications are a deformity of the wrist. The fracture could be open or closed. Deformity is a main symptom, their may also be bad swelling around the effected area. Moving or gripping may cause severe pain. An x-ray is required to determine the extent of the fracture. Immediate treatment is needed and it is advisable to use a sling as there are several bones in the wrist which may be effected too. 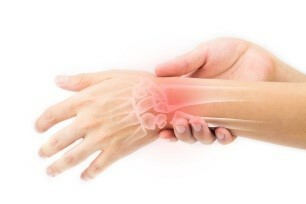 Carpal tunnel syndrome is a common injury which also effects the wrist. The main symptoms include pain, pins and needles, tingling and numbness. These are just some symptoms depending on how severe the injury is and if the player has a history of Carpal Tunnel Syndrome or not. Check out this video to find our more about the symptoms and diagnosis. Carpal Tunnel is best described as where the median nerve going into the wrist and the hand becomes compressed. If left untreated, it can lead to severe complications. When picked up on time in the less severe form of the condition, it can be treated easily. I have treated this condition using Kinesiology taping on multiple injuries throughout the years and am trained in this area. It is very effective but only if applied correctly, if it is applied too loosely in won’t have any effect. If it is applied too tight, in can inhibit or make the injury worse causing stress to the player. It is advisable that if you are not proficient in applying Kinesiology tape then leave it to a professional. That brings us to the end of our series on injury avoidance in rugby. Without doubt, it has become clear that without the right support and preparation, there are a huge amount of things that can go wrong on the rugby pitch. But by taking some of the tips and recommendations from this series, we hope you can help improve your level of safety on the pitch and stay injury free for as long as possible! 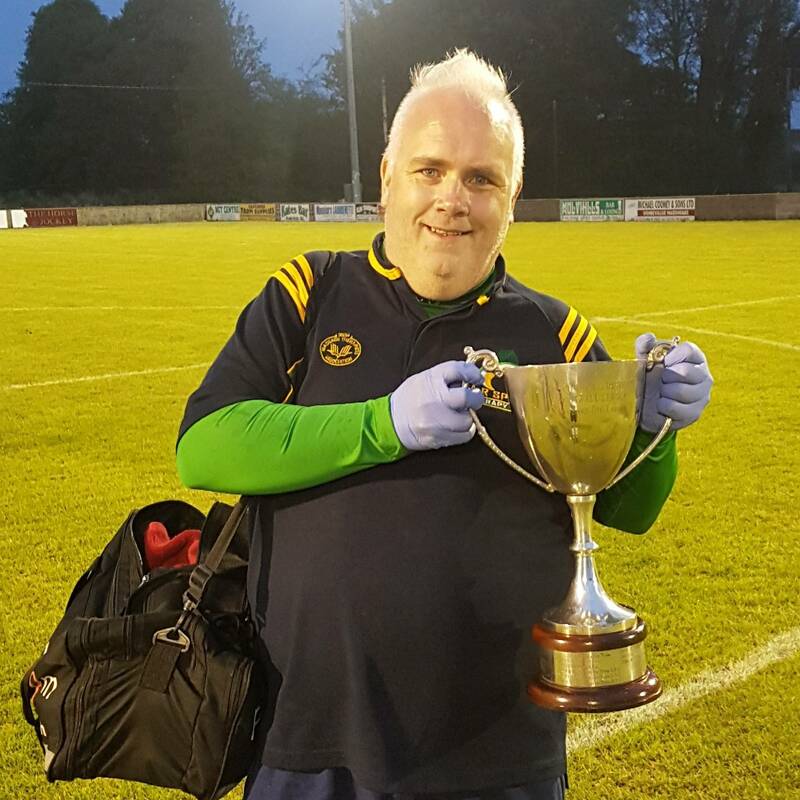 Aidan Raftery is the 1st Team Sports Injuries Therapist for St Peter’s FC of Athlone and Team Sports Therapist for the Ireland senior 6 a-side football squad. Aidan has years of experience and has worked with GAA, Hurling, Soccer and Rugby clubs in both Ireland and the UK. As a Sports Injuries Therapist and Massage Therapist, Aidan is a member of the Irish massage and Bodyworks Association and can be booked for appointments at his private practice in Roscommon. Check out the AR Sports Therapy Clinic business page to see a full list of opening times and learn about the packages available to suit a variety of clubs. Be it multiple bookings, once off matches or training sessions, Aidan can provide professional support in the long term or short term for both club and player.